The National Alliance on Mental Illness (NAMI) is dedicated to education, advocacy, and support for families living with mental illness. Monthly Support Groups for families have been available in Rockdale and Newton counties for the past five years. The highlight of 2018 for NAMI Rockdale/Newton is the achievement of Affiliate status approved by the NAMI Georgia Board of Directors. Going forward, our local affiliate will continue to provide support groups, community outreach meetings, educational opportunities, information tables at community events, and advocacy efforts. Additional plans for 2019 include building stronger connections with the Rockdale & Newton drug and accountability courts, promoting a group for peer to peer support, celebrating community partners with the first annual NAMI Rockdale/Newton Awards Banquet, and training more volunteers as support group facilitators and community educators. Four fundraising events provided over $3000 in financial support for local efforts: The Chi Tau Omega AKA sorority, NAMI Walks Georgia, His Hop Radio, and St. Pius Knights of Columbus Trivia Night. 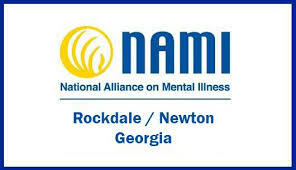 The NAMI Rockdale/Newton affiliate is grateful for the continued support. Thank you to Epiphany Lutheran and First Presbyterian Church of Covington for offering space for monthly Support Group meetings and including announcements of events in bulletins and newsletters. Local families and the community are stronger and healthier with your support.